U.S. Launches Iraq airstrikes on ISIS in Tikrit. 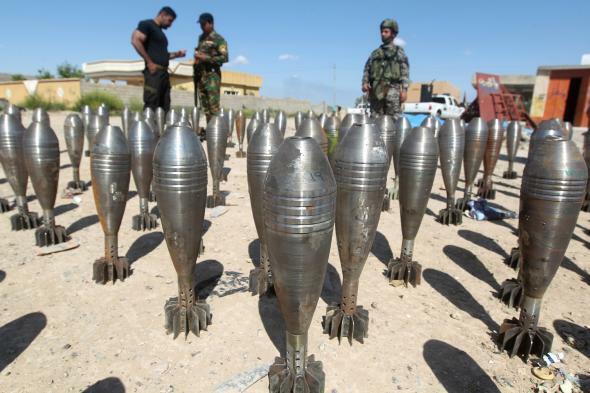 Iraqi policemen stand next to ISIS recovered weapons in Tikrit on March 17, 2015. The request for American air support comes after the Iraqi government chose to carry out the three week-old offensive, expected to yield a quick victory, with Iranian technical support, rather than U.S. air support. “The decision to give air support to the Tikrit campaign represents the biggest collaboration so far by the U.S.-led coalition, Iraqi forces and Iranian-backed paramilitaries and opens a new chapter in the war,” Reuters reports. “The battle for Tikrit is widely seen as a step toward the more difficult and potentially decisive battle to regain control of the larger city of Mosul,” according to the AP.